Even with today's fastest games, ASUS VP28UQG eliminates smearing and motion blur thanks to a 1ms response time - the fastest in its class. This astonishing visual performance lets you react instinctively to what you see onscreen, so you can take corners like a pro race car driver, or take an enemy out with a headshot as he peeks around cover. 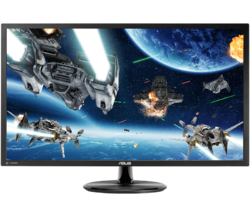 In addition, Adaptive-Sync/FreeSync™ eliminates screen tearing and choppy frame rates for even more seamlessly smooth gameplay. *Pay a 10% deposit today (£30.49), then pay the amount of credit in full within the first 12 months of the agreement and you'll pay no interest, only a £29.00 administration fee. Otherwise, interest will be applied from the date of the agreement and the balance due will be paid over a term of 36 monthly Direct Debit instalments with a 29.8% APR representative. You can settle this agreement (either in full or in part) at any point after the agreement goes live. You can settle this agreement (either in full or in part) at any point after the agreement goes live. The total amount repayable will be £538.45, or if you settle within the first 12 months £333.90.